As the saying goes “You can’t win them all”. Today Heather and I tried our luck on the Washington side of the Columbia Gorge. We traveled to Beacon Rock State Park to tackle Hamilton Mountain. The forecast called for light showers in the morning and a 40 to 50% chance of rain later in the day. As my brother would have said when he was young, “Beep wrong!” It turned out to be the wettest, windiest, cloudiest hike we’ve encountered to date. Despite the poor weather there were still plenty of bright spots on the hike and could tell that on a nicer day this hike would have been spectacular. The Hamilton Mountain trail first travels to views of a pair of waterfalls. Hardy Falls is the first you can see but the views are partly obscured. Just a little further up the trail is Rodney Falls and it’s Pool of Wind. A side path to the left leads to this a railed viewpoint at the base of the pool in a rock-walled bowl. Rodney Falls crashes down into this pool creating a mist filled wind that blows out of the bowl with good force. The Hamilton Mountain trail crosses Hardy Creek below Rodney Falls on a log bridge and continues on. About a quarter mile from Rodney Falls the trail splits creating a loop option for Hamilton Mountain. We took the right hand fork and started our climb. The trail passed through several openings with wildflower filled meadows. We spotted many different flowers offering a colorful display. The open spaces should have made for some excellent views too but all we could see was the white of clouds all around. Soon the wind picked up and at times nearly blew us over. For almost 2 miles we traversed the wildflower meadows through the wind and rain over the mountain. We finally reached the summit and were greeted with a wall of white so we sallied forth and continued the loop. This side of the trail proved less windy at first. After three quarters of a mile we came to the edge of a saddle and could see signs on the other end marking our trail junction. We could also see the wind fiercely driving clouds and rain up and over the saddle crossing. There was no turning back now so we headed across. At first I thought it wasn’t going to be as bad as it looked, then I got knocked off balance. By using my poles and leaning into the wind I managed to get the upper hand, but that moment was short lived. My rain poncho decided at this point to launch a surprise attack and I was suddenly engulfed by green waterproof fabric. After some artful flailing (Despite her laughter I am sure that’s how Heather would describe it) I got the poncho off my face and was able to complete the crossing with the thing now on backwards and completely unbuttoned. At the junction we took an old road and headed down to Hardy Creek and the trail that would finish the loop. On the way down the road we ran into a pair of Black Tailed deer. The two bucks were apparently attempting to climb the road and we all stood staring at each other for some time. They finally turned back down the road and disappeared into the forest and we went on to the creek. It finally cleared up just a bit as we came within a mile of our car and the Oregon side of the Columbia Gorge made an appearance. The rain also let up long enough for us to change out of our wet clothing and into something more comfortable. We both agreed that we will be trying this one again someday when the weather is better because we could tell it would be worth the return trip. On a clear day Mt. Hood and Mt. Adams would have been visible and the wildflower covered slopes were pretty even in these conditions. Happy Trails (wet or dry). Amazing! 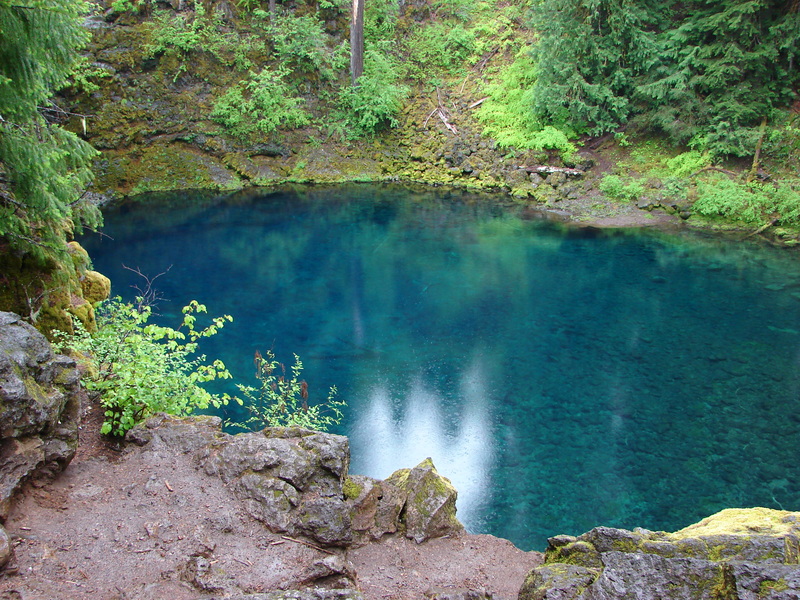 That is a good start in describing Tamolitch Pool which was the highlight of our most recent hike. Beautiful, gorgeous, and spectacular would also be fitting. We were looking for a good rainy day hike and decided on a section of the McKenzie River Trail in the Willamette National Forest. 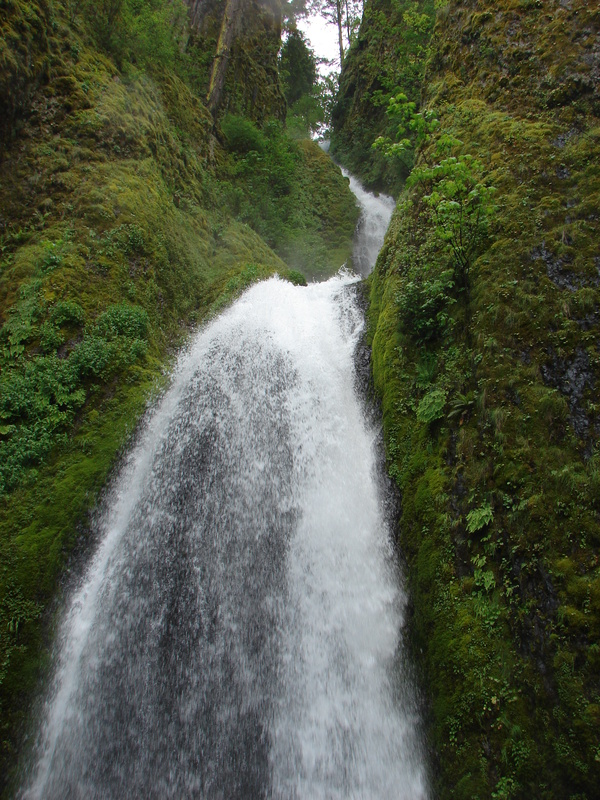 We had hiked a different section of the trail in September that passed Sahalie & Koosah Falls. This time we would start further down the McKenzie River with Koosah Falls being our turn around point. We arrived armed with our rain gear and set off through a lush, damp forest. The trail quickly descended to the river, crossed two creeks on bridges, and traveled next to the McKenzie for awhile. 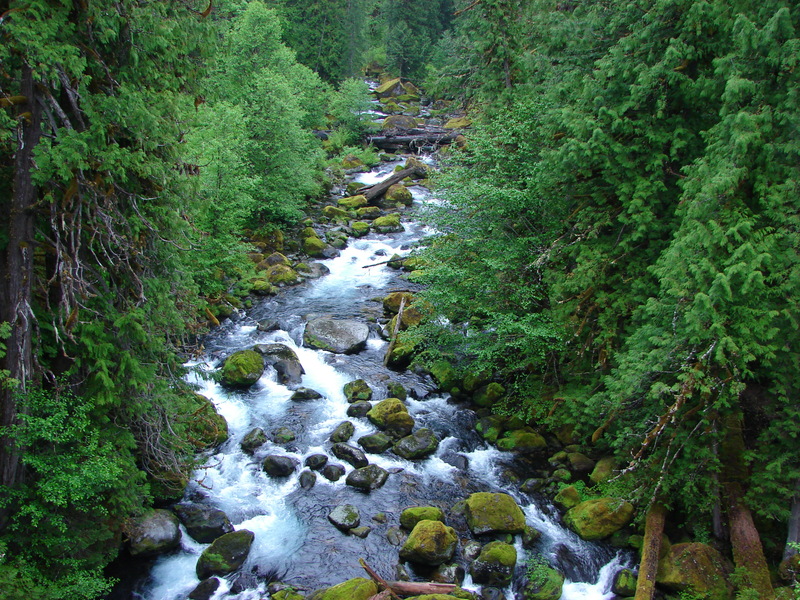 It then climbed above the river as it crossed an old lava flow with moss covered rocks and numerous views to the roaring river below. Our first view of Tamolitch Pool came just after the 2 mile mark. It was one of those “take your breath away” moments. The pool sits in a small bowl below a dry waterfall. The crystal clear water offers a view to the bottom and is a blue that is truly stunning. We spent some time exploring the rim of the bowl watching the McKenzie River flow full speed ahead from this still pool’s outlet. After a snack we continued up the trail following the now dry riverbed toward Koosah Falls. 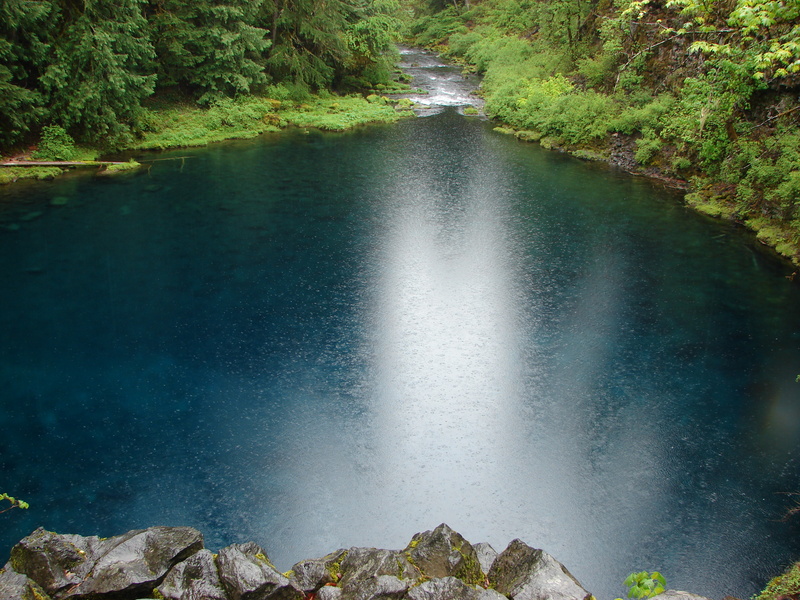 Somewhere below us the McKenzie River flowed underground, buried by a lava flow, on it’s way to Tamolitch Pool. The forest along this portion of the trail changed often as we crossed the old riverbed on a series of log bridges. After another 3 miles we reached Carmen Reservoir (and most importantly bathrooms) where the McKenzie was once again visible above ground. Another 0.4 mile stretch brought us to Koosah Falls and our turn around point. The weather threw us a curve ball this last week. After enjoying a couple of weeks of summer like weather snow returned to some of the lower elevations. A fact we discovered on the way to our most recent hike. After seeing the amount of snow on the road to the Wildcat Mountain trail head we decided to alter our plans a bit and headed to the Columbia Gorge instead. Despite the side trip we arrived at the Angel’s Rest trail head (Bridal Veil exit 28 off I-84) before 7:30am. There was only one car in the parking area which we knew would change by the time we hiked back out given the popularity of the Gorge trails. 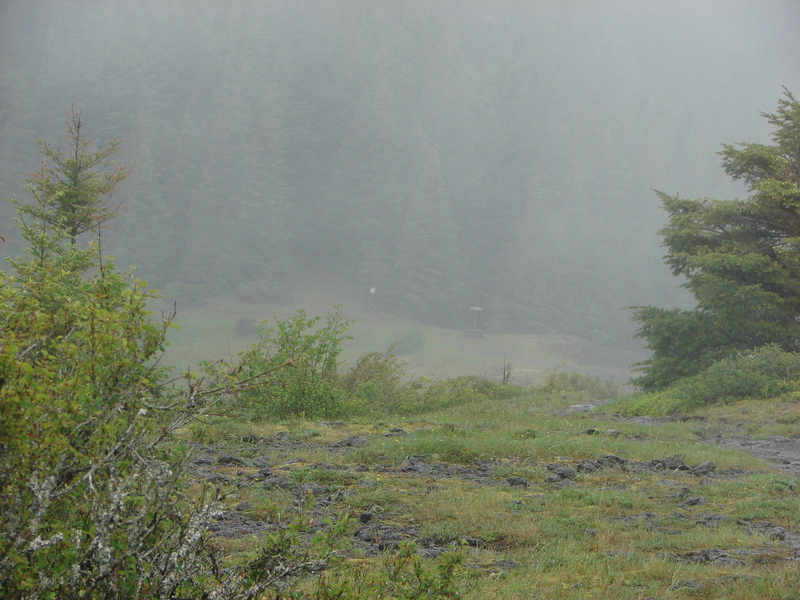 The weather was typical of our experience hiking in the area, low clouds and mild temps. The trail set off in a damp green forest and made it’s way on a steady climb up to Angel’s Rest, a rocky bluff overlooking the Columbia River. The trail was lined with flowers along the way, mostly larkspur and columbine but many different varieties were present. After passing Coopey Falls views begin to open of the Columbia River to the west especially as you reach a rock field crossing. We were surprised by the width of Angel’s Rest when we arrived at the bluff. It was much wider than we had expected and we spent some time exploring around the area and because we arrived early we had it all to ourselves. When we first arrived here we were in the midst of some very low clouds which obstructed our views but they eventually moved on allowing us to see across the river to Washington. The round trip to Angel’s Rest is about 4.6 miles so we had planned on combining this hike with the Wahkeena Falls trail a couple of miles to the east via the Foxglove trail. This trail obviously doesn’t see much traffic and was fairly overgrown but usable. By the time we had completed this 1.3 mile segment we were pretty soaked from the damp leaves that we brushed against. 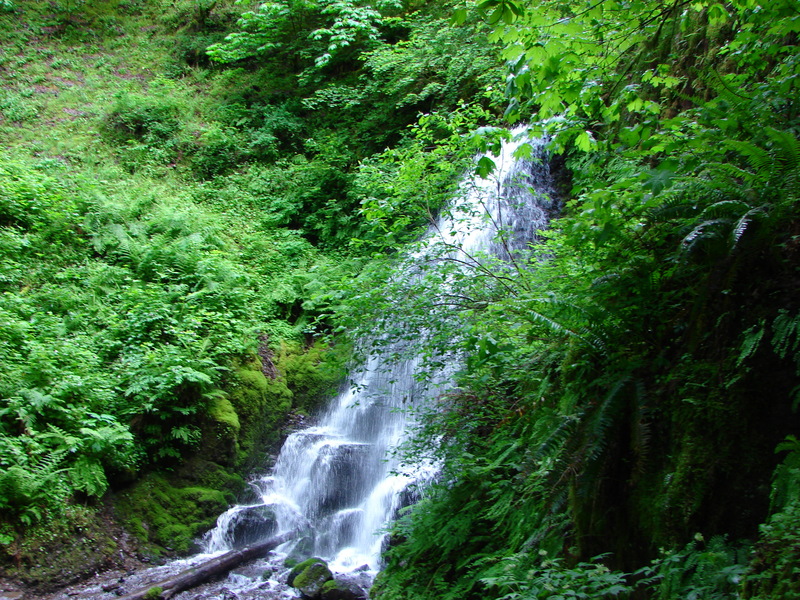 We then continued on the Angel’s Rest trail passing pretty Wahkeena Spring to the junction with the Wahkeena trail. 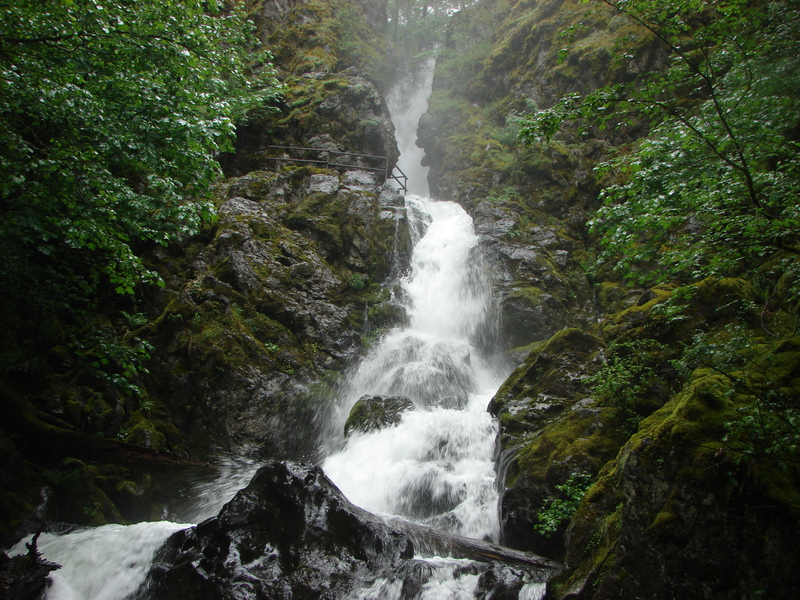 The Wahkeena Trail followed Wahkeena creek down through the forest with a brief side trip to Fairy Falls. After passing below the falls the trail rejoins Wahkeena Creek crossing it twice before joining a paved path that switchbacks down to Wahkeena Falls. The closer we got to the falls the more crowded the trail became but we eventually picked our way down to the double cascade of Wahkeena Falls. Next came the most dangerous portion of the hike, crossing the historic Columbia River Highway and the seemingly endless stream of cars creeping along trying to get a glimpse of the waterfalls along the way. After a successful game of Frogger and a brief pit stop we headed back up the Wahkeena Trail to begin the 6.7 mile trek back to our car. In our last post I said we had completed our final planned hike with less than 1000ft or elevation gain for the year. I chose the word “planned” because I knew I needed to leave open the possibility of an unplanned hike. It only took a week for that to prove wise. We had a hike free weekend but wound up with the opportunity to go on a hike in Central Oregon with my parents and assist them with trying out their new Garmin GPS unit. 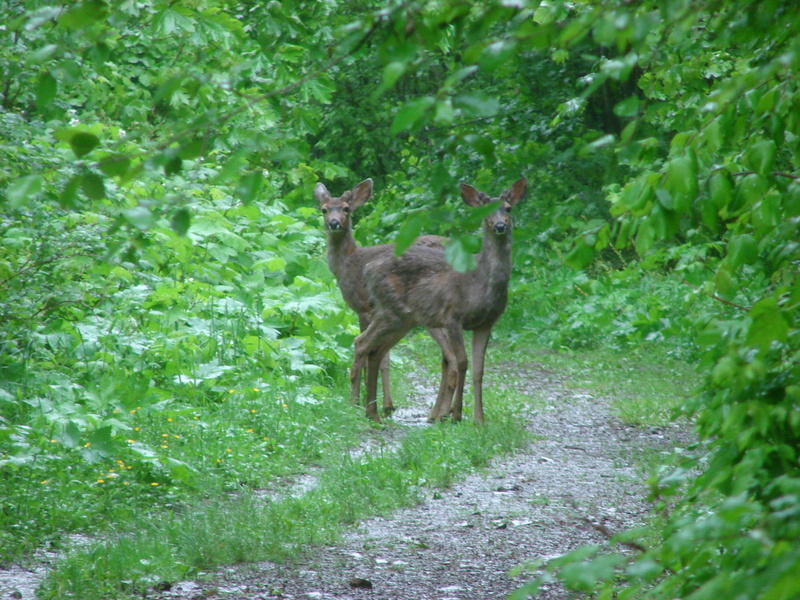 We had planned on meeting them last weekend after our hike in Detroit, but a deer had different ideas and they were unable to make it. 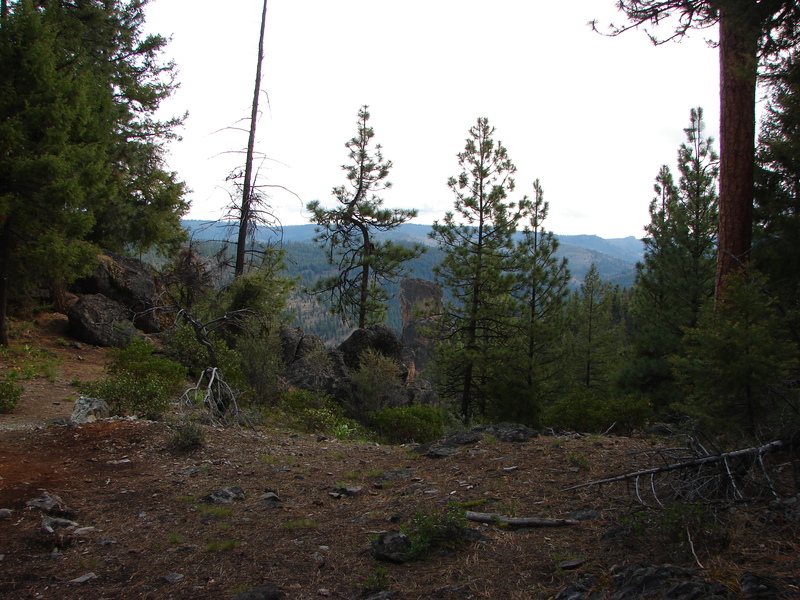 This was our first chance to take a hike together and we decided on hiking to Steins Pillar in the Ochoco National Forest east of Prineville Oregon. This was a new trail to all of us, but we had seen the pillar last year when we hiked to the Twin Pillars in the Mill Creek Wilderness. The trail clocks in at 4 miles round trip with just under 700ft of elevation gain. The trail head is near a small meadow surrounding a little spring. A number of bright yellow flowers as well as large solomonseal and wild strawberries were present. While we were getting ready to begin the hike I spotted a fritillary which was the first of that type of flower we’ve encountered. We were all pleasantly surprised by the diversity that the trail had to offer. The forest seemed to shift constantly from firs to ponderosa pine to juniper and back. 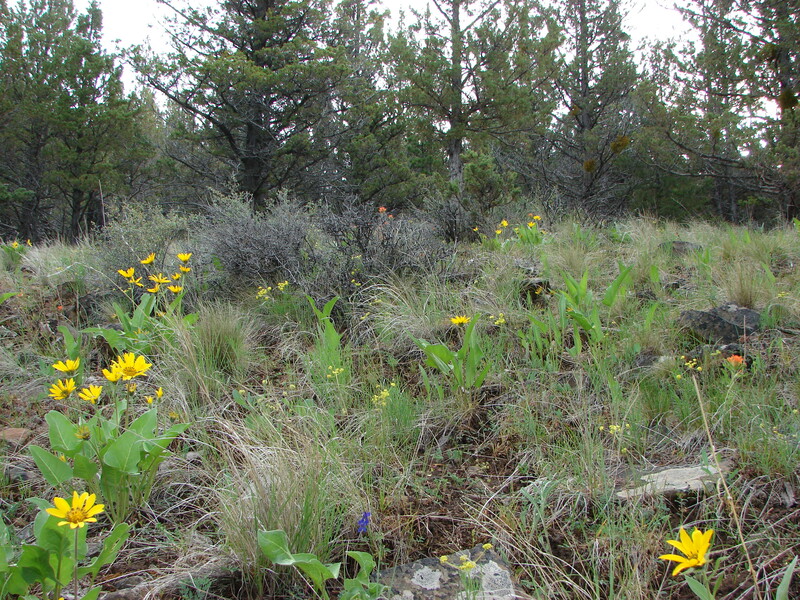 The collection of wildflowers was even more diverse with white death camas, yellow balsamroot and arnica, purple larkspur and phlox, and various shades of paintbrush. A number of others were present as well including desert parsley, giant-head clover, penstemon, and naked broomrape (an unfortunate name for a cute little flower). In addition a large number of lupine leaves promised a good show within a couple of weeks. A nice opening offered a view toward the the Three Sisters but on this day low clouds ensured that the Cascade peaks were mostly hidden. It mattered little though as the wildflower show more than made up for the missed view. After 1.8 miles the trail finally offers the first glimpse of its goal -Steins Pillar. From the viewpoint the trail descends for 0.2 miles to the base of the pillar. The pillar is made of rhyolite ash that has been compacted. The area at the base makes for a nice lunch spot with views across Mill Creek to the Twin Pillars. Much of the elevation gain is due to the climb back up to the viewpoint up several sets of stairs. As usual most of the wildlife we spotted was from the car on the way to and from the trail head. We saw several deer from the road but the trail offered a Northern Pacific Treefrog and a few Golden Mantled Squirrels. In all this was a very nice hike and a great time of year for it. Until the next time, Happy Trials. Well it seems that summer has arrived early in the Pacific NW. We’ve enjoyed some unusually warm/dry weather which has me making some adjustments to our hiking plans. We’re hoping that some of the trails will be snow free earlier this year than the previous couple. On the flip side we’re hoping that the weather doesn’t translate to an early or particularly bad fire season, but I digress. On to the trip report for the South Breitenbush Gorge trail. For the second hike in a row we headed to the Detroit, OR recreation area, and for the 2nd week in a row we were greeted with great weather. This time we would be hiking the first 3.6 miles of the South Breitenbush Gorge trail. The trail itself continues on to Jefferson Park (one of my favorite places) where it meets the Pacific Crest Trail. 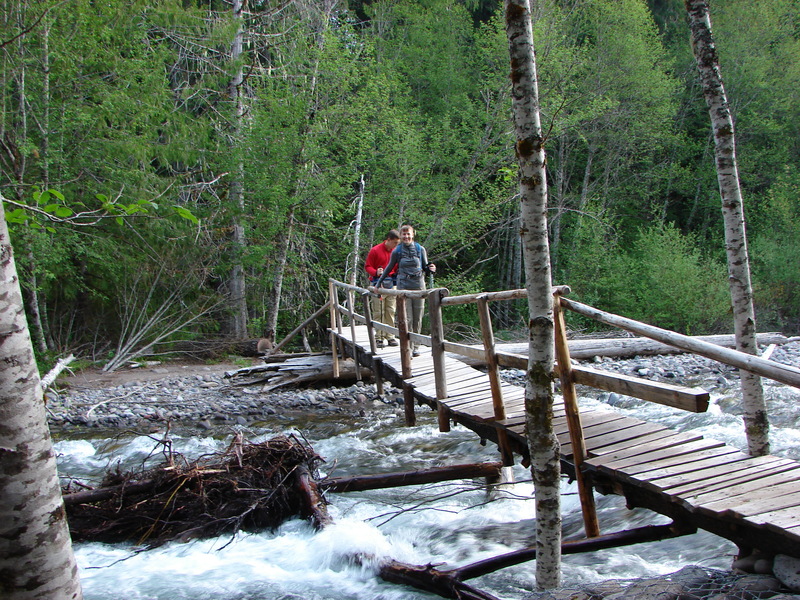 The trail sets off near the South Breitenbush River and quickly crosses it on a series of footbridges. Our sources (William Sullivan’s “100 Hikes in the Central Oregon Cascades” and Oregonhiking.com) had warned that these bridges are prone to floods which was apparent upon seeing them. They were a patchwork of styles and materials which only added to their charm. This one in particular was rather bouncy which Dominique found a bit unsettling. Once across the river the trail followed along at a distance through the forest. Never out of earshot but seldom in view the South Breitenbush flowed along on it’s way to Detroit Lake. In addition to the sound of the river there was almost always a bird singing, and though we didn’t see many we knew there was always one close by. 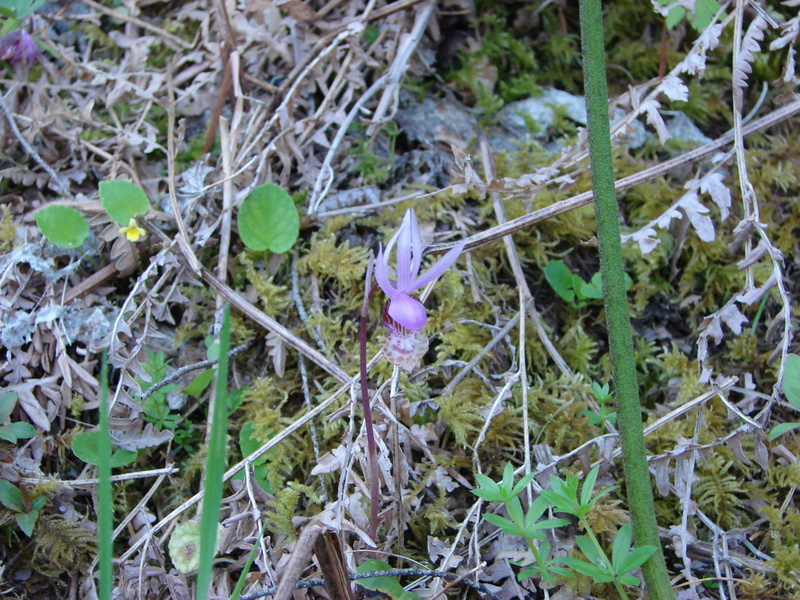 Like last week we spotted a flower that we had not previously seen on a hike. Last time it was Fairy Slippers (of which we saw many on this hike) and this time it was Fairy Bells which are twin small white flowers. In addition there were many other flowers in bloom including Wood Violets, Sourgrass, Red-Flowering Currant, Salmon Berries, Strawberries, Trillium, Vanilla Leaf, Oregon Grape, and Solomonseal. Rhododendron and Beargrass were present but had yet to bloom; although, there was a very colorful bud showing on a single Rhody and I managed to spot a Beargrass bloom along the road on the way back to Detroit. Heather is sure I am obsessed with Beargrass. She might be right. The trail was well maintained and never steep. Our goal was to reach Roaring Creek then continue another .5miles to a pullout on road 4685 that can be used as an alternate trail access. Roaring Creek was the scenic highlight. 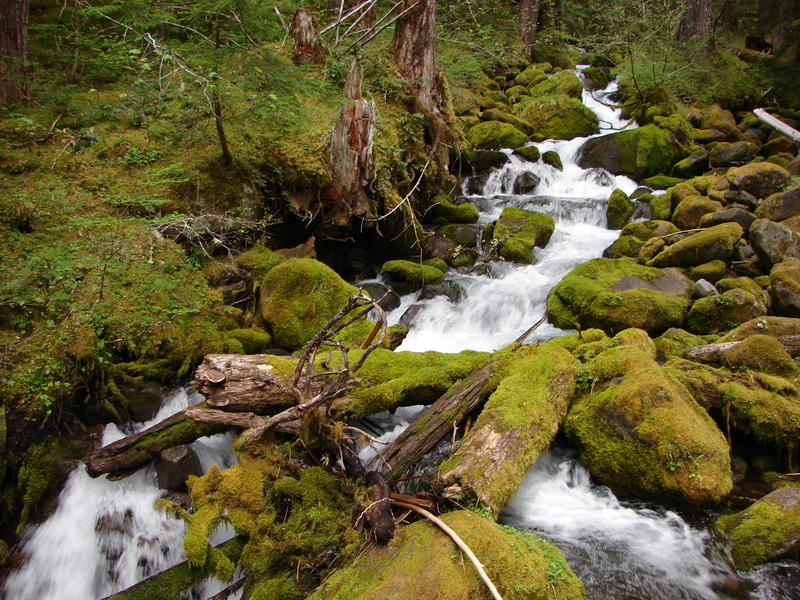 The water cascading over mossy rocks down through the forest was very pretty. After spending some time taking in the view we continued on to our turnaround spot where we spotted a rough skinned newt and headed back to the car. This was our final planned hike with less than 1000 feet of elevation gain as we get ready to start climbing up to some better viewpoints. Something of which we are all looking forward to. Until next time – Happy Trails. Sometimes the weather makes you an offer you just can’t refuse. This was supposed to be an off weekend so Heather could rest after last weekends Eugene marathon, but the prospect of clear skies and 80 degree weather proved to be too enticing. We decided to sneak in a short hike to take advantage of the summer like conditions and chose Stahlman Point near Detroit Lake. We had started this hike a couple of times in years past but due to time constraints had never had made it to the summit viewpoint. 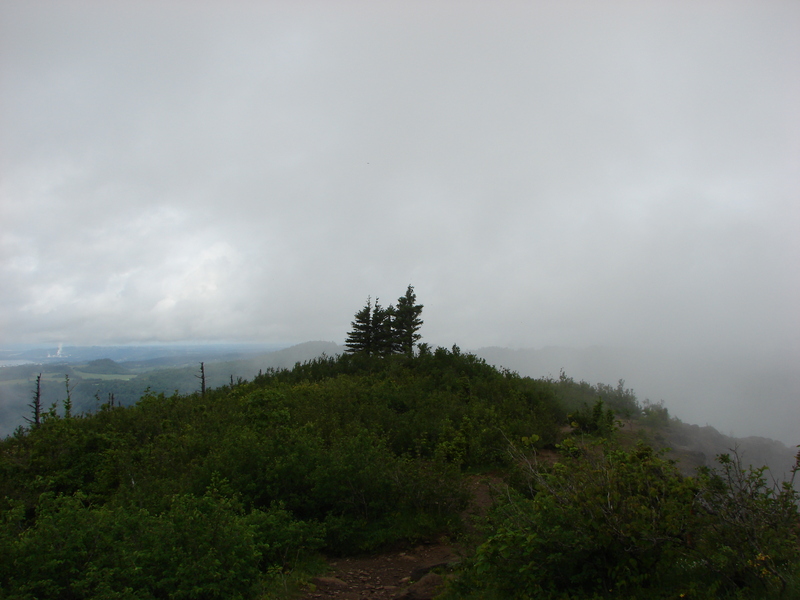 The trail gains just over 1300 feet in 2.3 miles to the site of a former lookout tower. The morning got off to a rocky start when I woke up 45 minutes after the alarm was to have gone off. Anyone familiar with the Sienfeld episode with the marathon runner should know it was the volume. Luckily we always get everything we can ready the night before a hike so after a bit of scrambling we were off at our normal time and were hiking by 6:30am. There were several types of wildflowers in bloom including trillium, sourgrass, yellow wood violets, and our first encounter with fairyslippers. It was still too early for the rhododendron and beargrass blooms but they were both starting to show buds and in a few weeks should be putting on quite a display. The trail offered a few glimpses of Detroit Lake and the ridges of the Willamette Forest beyond. A small spring trickles across the trail near the 2 mile mark. 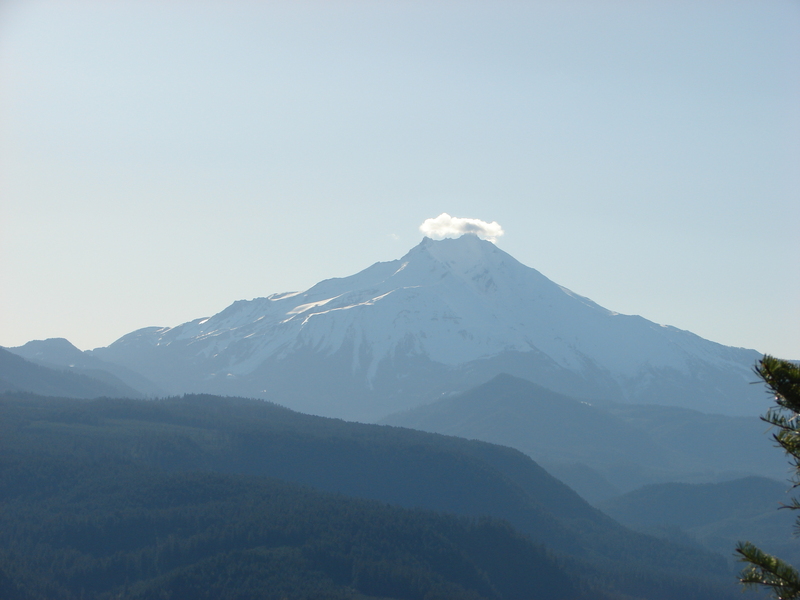 It then ends at a rocky viewpoint that was once home to a fire lookout. Here among the rocks were several other types of flower including a single penstemon that we nearly missed hiding at the base of an outcropping. The viewpoint provided a clear view of Mt. Jefferson to the northeast. A lone cloud hovered over it’s summit and seemed to refuse to budge from it’s perch. Several birds joined us while we had a quick snack and took in the view before heading back down to the car for our drive home.